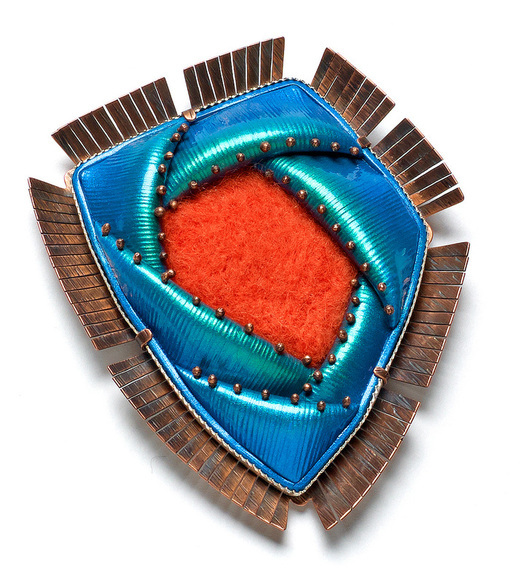 In 2013, polymer artist Helen Breil contacted me and asked if I'd be interested in making a collaborative piece of jewelry. Of course, I jumped at the opportunity! Helen is a force to be reckoned with in the polymer world, and I'd been a fan of hers for some time. We decided that she would send me a few of her polymer bezels, I would pick one, and complete the piece using my metalsmithing and felting techniques. 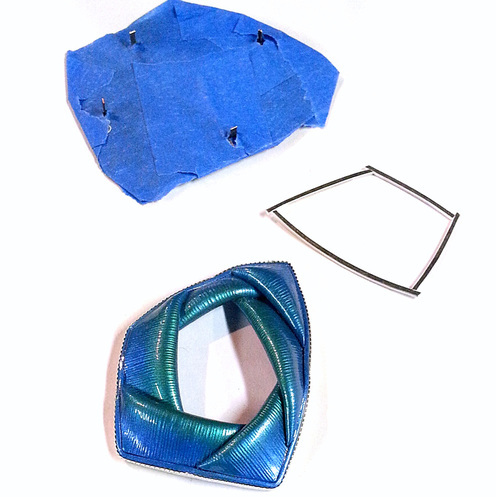 I chose a vibrant, totally-out-of-my-wheelhouse, folded blue polymer bezel. My work is typically less angular — and less blue — so I wanted to give myself a challenge. I'd say it was a success! I created a fine-silver bezel-wire frame for the polymer, and accented the folded edges with dotted elements of balled-up copper wire. 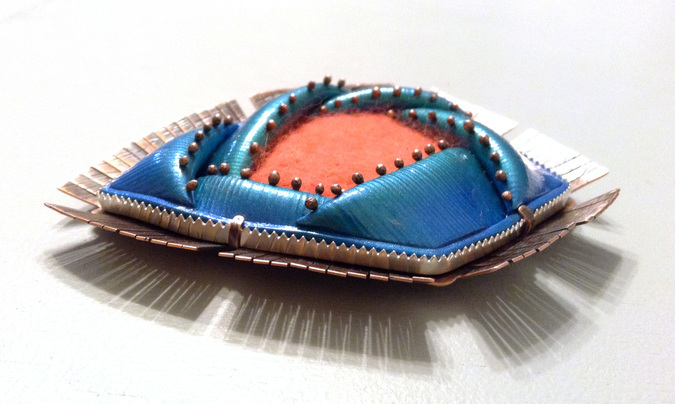 To complement the blue-green of the polymer, I chose to make the backplate out of copper. 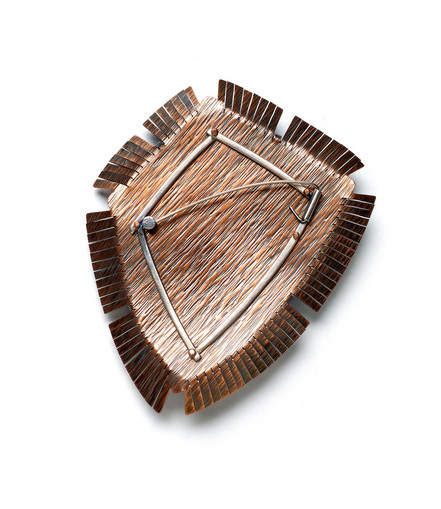 The hand-textured and patinated copper (textured to mimic the linear texture of the polymer) serves to not only mount the polymer with my signature tabbed edges, but serves as the foundation for a hand-fabricated pin back. The sterling silver pin back and frame was first riveted to the copper backplate, and then the polymer/silver bezel was set, trapping a vivid red-orange piece of handmade wool felt between the layers. The components, mid-process. The copper backplate is protected with tape so I could finish the tabs without scratching the surface. 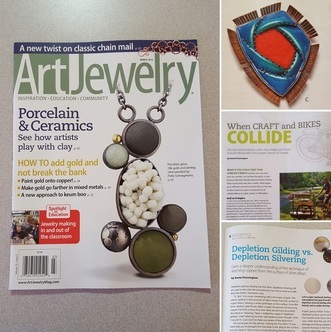 To top it all off, our brooch was featured in the Gallery section of the March 2016 issue — the final issue — of Art Jewelry magazine, where I was the Associate Editor for over four years. Working with Helen was a real treat, and I'd love to collaborate with her again. I've got my fingers crossed that we'll get to work together again soon!